Do you feel like you are not the best version of yourself yet? Do you feel like you haven’t reached your full potential in life and you aren’t operating at 100%? If you answered yes to either of these questions, you are in the right place. It’s time for you to change this belief by learning how to live a life that is filled with happiness, abundance, prosperity, and everything that makes life feel fabulous. Some people believe money is the key to happiness. Others believe having lots of things like bags, cars, or fame is what makes life great. Money, attention, and material items may sound good, but what if I told you, the key to unlocking your best self all starts with you making choices. What kind of choices, did you ask? Well, I’m glad you asked! I’ve included 5 different ways you can start being your best self, Today! It’s time for you to kick things up a notch. Raise your hand if you want to live the same mundane, routine induced life, day in and day out? I know I don’t and I can bet you 10 squats, you didn’t raise your hand just now. Thank me later. Seriously, it’s time for you to step out of your comfort zone. Did you know, when you have something new to look forward to, a sense of excitement, healthy nervousness, adrenaline, and mystery become your new fun emotions? Then, when you do that new thing, it has the power to increase your confidence and self-esteem. It also improves your personal development, reduces boredom, and possibly loneliness if you try that new something around people or with a friend. A few years ago when I felt lost, sad, and confused about life, I tried something new to get me out of my funk. I turned to writing, which is something I used to do as a kid. This time, I wrote inspirational quotes and put them on social media so I could help uplift and inspire others while I elevated my own life. It was kind of like my form of therapy. Now I encourage you to think. What one new thing can you do today that was not part of your agenda and is not in your comfort zone? It can be a minor tweak in your day or a major new adventure! Don’t wait another day to start pursuing your dreams. If you have a passion, purpose, dream, desire, or goal that you want to accomplish, go after it like your life depends on it. That’s what I did when it came to my book “perfectly imperfect.” I fiercely wrote, edited, did research, hired an editor, spent money, and wouldn’t stop working on it and praying about it until it was in my hands. Now not only is it in my hands but it’s available worldwide on amazon.com. I won’t assume you know your purpose so perhaps you’re a little cloudy on yours. Maybe you haven’t taken the time to discover what your purpose is. If that’s the case, I have a workbook to help with this. Take your time in deciding what you want to do then, take an action step the day you figure it out so you will get closer to accomplishing it. Complaining ain’t cute. Not the best grammatical way to say this but it’s definitely the realest way. If you’re like me, you don’t particularly enjoy hearing people complain. It’s likely people don’t like to hear you complain either. It’s okay to vocalize your frustrations and express your concerns but it’s not okay to dwell in the negative. Complaining puts you a negative mindset and robs you of your positivity. If you’re used to complaining, this may not be the easiest habit to drop but it’s possible. Today I did a live broadcast on Instagram, click here to follow me there so you don’t miss a broadcast, and I gave an example of getting stuck in traffic. Getting stuck in traffic is something that is inconvenient and can feel annoying when it happens but we don’t have to complain about it. Instead, we can see our elongated time in our cars as a gift from God, the Universe, the Divine or whichever higher power you honor, and become grateful. So the next time you’re stuck in traffic try to take the positive route. Speaking of gratitude and affirmations, they have been essential in helping me become my best self. I believe, gratitude is like a boomerang that brings back what you put out into the universe. The more times I express gratitude, the more times opportunities to be grateful appears. Try saying thank you more, practice gratitude with a smile on your face and joyful heart. You are still here, alive, reading this, on your technological device, so this alone gives you something to be grateful for. Once you practice gratitude begin to call abundance into your life. That abundance can be greater affirmed with positive affirmations. You can create and recite affirmations that are related to self-love, money, relationships, etc. 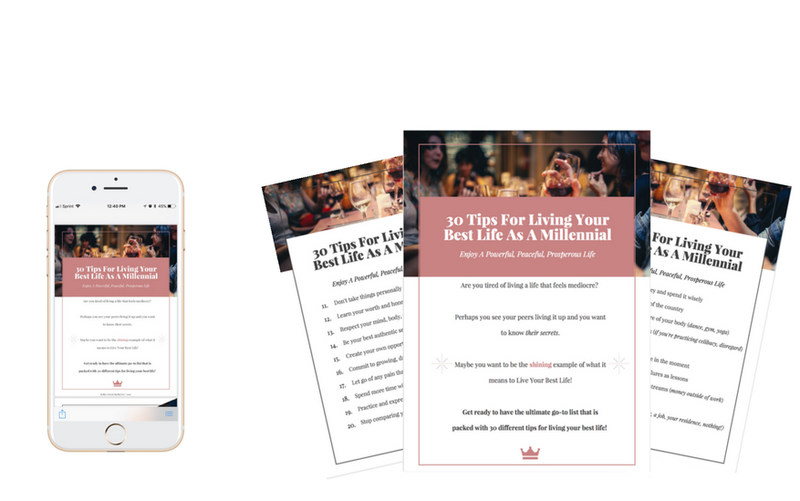 If you aren’t sure where to start with effectively creating your own, I’ve made a free guide to mastering affirmations which you can download here. It includes some i’ve created for you and the guide takes the guesswork out of affirmations s you can focus on saying them intentionally. What you read and focus on will reflect outwards as experiences, emotions, and energy in your life. That’s why it’s important to digest articles, blog posts, and inspirational quotes and messages so you stay in a positive mindset. Subscribe to blogs that spread empowering messages. Becoming your best self is a lifelong process because we are ever-changing and ever-growing, which is the beauty of life. Now that you have a few ways to work on becoming your best self, which will you try? What have you been trying already? Tell me below in the comments.